In the 25-odd years that I’ve been involved in competitive paddling, many things have changed. One thing certainly hasn’t: the ego-driven idea that anyone who is paddling a stable boat is somehow inferior. The reality is that most K1 paddlers in South Africa are paddling boats that are actually too unstable for them. 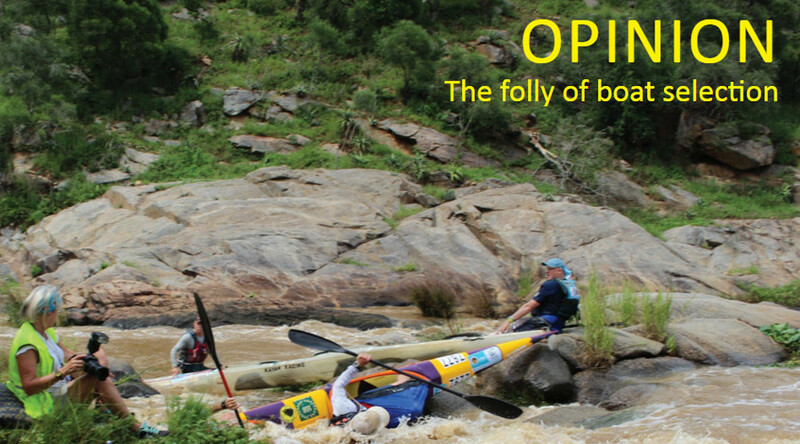 In this first instalment of my new ‘Opinion’ series, I would like to focus on the most basic decision when it comes to paddling: which boat to choose. If a paddler can’t put 100% of their pulling power into a forward stroke because of the need to use some energy to maintain their balance, the paddler is in the wrong boat. This applies to flat-water (which includes windy conditions and the mess at the start of a race), surf-skiing as well as river-racing. It is just about impossible to establish a good paddling technique if a paddler is not 100% comfortable with the (in)stability of the boat. When it comes to river paddling, it is just as impossible to learn different paddling strokes and techniques if stability is in question. In the SA racing fraternity, there has always been a big drive to get paddlers into the fastest, slinkiest K1 as quickly as possible. In addition to that, most paddlers tend to do river races using similar boats to those paddled in flat-water time trials. This makes zero sense. A more stable boat means better control, which means less swimming, better safety, less boat-breaking and also more fun. I’ve been a spectator at many K1 river races over the years, and every time I am appalled by the bad lines and silly swims on display. Building better skills is a topic for another day, but it is clear to me that most swimmers were paddling boats that are actually too unstable for them. For many paddlers, river racing is a survival mission every time they get on the water. They end up bracing through rapids instead of paddling and controlling their boats. Inevitably, they also take unnecessary swims, which is time-consuming, exhausting and always carries the risk of losing or breaking a boat. On our local section of rapids below Parys on the Vaal River, many ‘experienced’ K1 paddlers have had bad swims, broken boats, etc. Yet, my 9-year old son paddles the same rapids regularly with his sit-on-top kayak. He is a competent and safe paddler; he now leads the rapids when we trip. He can catch just about any eddy in most rapids, do difficult ferries and surf some waves. Why can he do that? Because the stability of his boat matches his skill level. Another example is that of the thousands of commercial clients who run rapids every year on inflatable two-person rafts (crocs). I’m not suggesting that paddlers should enter races in slow inflatable rafts; the point is that with the correct craft, anyone can be a safer paddler by being more in control and swimming less. When new paddlers join clubs, encourage them to paddle stable boats, especially sit-on-tops, for as long as possible. Don’t push them into unstable boats too quickly. This will require a fundamental mind shift from current club members, as it has been the default mentality to do exactly that. New paddlers very quickly realise that they are being looked down on for paddling stable boats. Join a club. Encourage paddlers who are not currently in K1s (in other words, paddlers with recreational sit-on-tops, touring kayaks, etc) to join clubs and races too, and allow them to keep paddling those stable boats instead of pushing them into fast K1s. Encourage paddlers to use much more stable K1s and K2s for river races. We all want our sport to grow.Welcoming, accepting and encouraging paddlers with more stable boats will go a long way in achieving that. Experienced paddlers, remember this: an unstable paddler is an inefficient paddler. It is not easy to resolve this issue, as a macho view on boats has been entrenched in the SA racing community for decades. But, I believe that this is the single biggest factor that keeps the sport of paddling from growing.